How to Make a Homemade Drum. 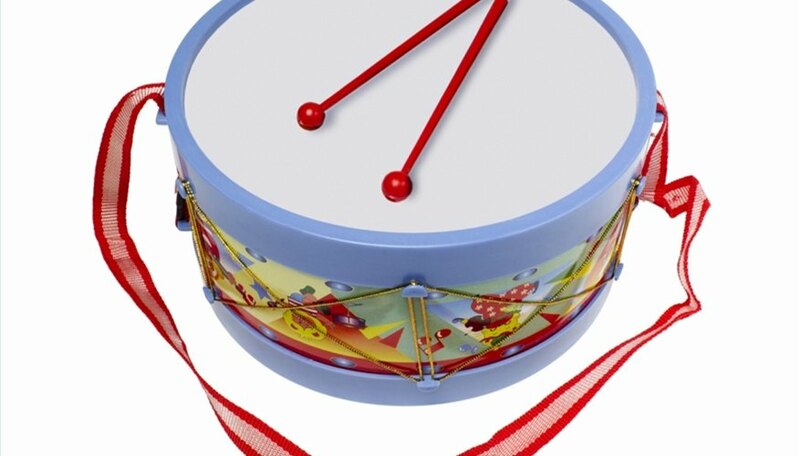 If you have a little music maker in the house that loves to make noise but isn't quite ready for a full-sized drum set, you may want to make your own homemade drum. This can be a fun craft to involve children whether it is an activity done at home, church or school. Here are the steps to make your own homemade drum. Find a canister to make your drum. This can be a large recycled coffee can or an empty oatmeal canister. Decorate the type of cylinder you choose with paint, or glue on construction paper or pictures cut from a magazine. Choose from several different materials to make your topper. Decide what to use as drum sticks. You may use inexpensive wooden chopsticks, or make your own drum sticks by using two unsharpened pencils. Cover the pencils by wrapping them in heavy yarn from the eraser down. Tie into a knot, glue the edges and let dry. Let your little drummer make some noise! If you want to control the noise level, wrap more yarn around the pencils for a softer sound and less for a louder sound. You may simply use the lid as a topper, such as the lid on an oatmeal canister. If using a coffee can, you may cut the bottom off a rubber punch ball to use as your topper. Stretch this across the top of your canister, and secure with the thick rubber band. Trim the excess with scissors.You may also use an acetate cloth and glue mixture for your topper. Glue around the edges of your canister and stretch your cloth across the top. Secure with a thick rubber band. Mix three tablespoons of white glue with one tablespoon water. Brush onto the cloth, and let dry for one hour. Repeat this process for a second coat.